Many of the nation’s top shooters were honored Tuesday evening during the NRA Long Range Championship Awards Ceremony. Standing tall on the podium was David Tubb, 2011 Long-Range National Champion. This is the seventh time Tubb has won the Long-Range title. Last year’s Long-Range Champion, John Whidden, finished second. Notably, Rodrigo Rosa finished third — a superb performance by a relative newcomer to the competition. In addition to the Mumma trophy for the LR Championship, numerous other awards were given for the many separate long range trophy matches conducted over the past week. Among the award-winners were Rodrigo Rosa, John Whidden, Nancy Tompkins-Gallagher, Noma Mayo, and SGT Sherri Gallagher, 2010 High Power National Champion. Share the post "NRA Honors Long-Range Shooters at Awards Ceremony"
The Remington Rifles were donated as prizes to the winners. It’s an embarrassing photo for such a prestigious event. They certainly are donation rifles but they donated them to the wrong folks. They should be donated to those less fortunate. Isn’t this the most prestigious rifle competition in the country and one of the oldest? If you’re going to award something, how about it match the prestige or don’t award anything. The trophy should suffice. Don’t cheapen the event with something you’d buy at Walmart unless it’s the Walmart Cup and that’s what you shoot to win it. I’m not an elitist but that photo just rubs me the wrong way. Maybe I need to take a chill pill. I think they were very good prizes. 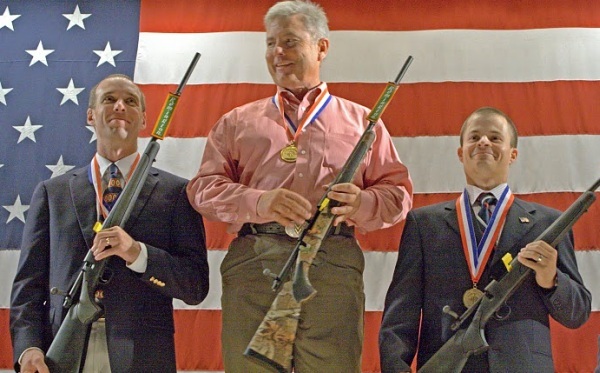 For years, the NRA gave out tshirts and a few pounds of powder to national champions. I think they’re on the right track. The problems getting industry involvement in high power. There’s no incentive. I encourage you to work to get industry involved with our sport.